Ivan Zulueta was born Juan Ricardo Miguel due to the Russian origin of that name, which was not allowed by anti-communist Franco dictatorship, in San Sebastián, Basque Country, Spain. His family was wealthy: his father’s family had had sugar factories in Cuba for generations. His father was a lawyer; even though he combined his job with other activities, such as director of the San Sebastian Film Festival. His mother was a painter, even though not professionally. Hence, Ivan was closed to the art in his youth. Zulueta moved to Madrid in 1960 and enrolled in decoration courses. At the end of 1963, he was offered the opportunity of traveling in a merchant vessel to New York. There, he enrolled in Arts Students League for studying oil painting and advertising drawing. Zulueta discovered pop art, Nouvelle Vague, the New American Cinema and artists such as Jonas Mekas and John Cassavetes. Coming back to Madrid in 1964, Zulueta enrolled in the Spanish Cinema School. He directed a couple of shorts in 35 mm. The first one, called Agata, based on a short story by Edgar Allan Poe. And the second one, called Ida y Vuelta (Round Trip), based on a short story by William Jenkins. However, he did not get his degree and the School was closed by the dictatorship. Zulueta would not be allowed to sign his works until Franco died because of this. In 1968, Jose Luis Borau, his teacher in the Film School, produced a TV show called Ultimo Grito (Latest Trends). The anchormen were Jose Maria Inigo and Judy Stephen. Ivan Zulueta directed the show. The production means and budget were low. The way of working: friends in different positions and creativity. In 1969, Un, Dos, Tres, Al Escondite Inglés (Hide and Seek) was produced. It was Jose Luis Borau’s first work as a producer of a full-length movie. The production was carried the same way as in the TV show Ultimo Grito. The film was a musical which made fun of Eurovision contest with a Richard Lester style. It was first released in Cannes Film Festival. Jose Luis Borau provided Zulueta with unused film from his newly-created production company. Zulueta used it for experimenting mainly with tempo and editing. He also used other underground formats like 16mm or 8mm. Most of the time, the experimentation was related to re-fiming preexisting material in other formats and rhythms. This visual style was very popular in those years, used by other directors and achieving a peak with the eminent Koyaanisqatsi (1983). At same time, Zulueta started a prolific career as poster designer. Ivan met Pedro Almodóvar and helped him in his first underground short movies. Zulueta also worked as assistant director for other directors such as Jaime Chavarri or Antonio Drove. A Spanish architect interested in movies decided to help Zulueta financially. The planning was a 15-day filming. However, it was shot in real interiors owned by Zulueta and other friends, like Jaime Chavarri; and most of collaborators used drugs like heroin, that drove the planning and the budget to be highly increased. Pedro Almodóvar dubbed one of the female characters, but he was not credited. The relationship between the director and the producer was poorly damaged. Moreover, the film had a lot of problems to be commercially released due to its experimental and underground style; even though the dictatorship had fallen through. It was finally released in 1980. 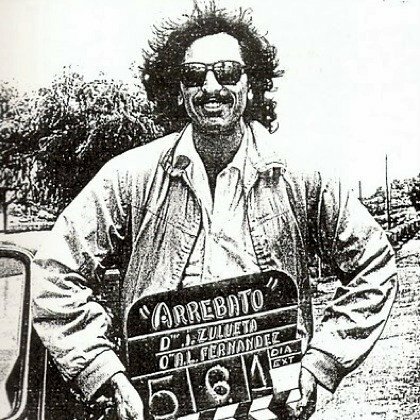 Ivan Zulueta was labeled as a problematic auteur and Arrebato became a cult movie. Finally, his heroin addiction forced him to retire temporarily. Living in San Sebastián, he declined offers for new projects in filming industry. On the other hand, Zulueta continued with his career as poster designer. It is in these years when he produced his best known works for Pedro Almodovar, among others. He also started experimenting with photography. At the end of the 80s and the beginning of the 90s, Zulueta directed a couple of episodes for two different TV serials. The first one, called “Parpados” (“Eyelids”), was a love story between a couple of twins. The second one, called “Ritesti”, was a horror story. Both were traced by Zulueta’s style, visual obsessions, circular screenplay, format mixing (film and video) and a fragmented editing which reminded some of David Lynch movies. By mid-90s, Zulueta came back to the silence. He continued his work designing posters. However, at the beginning of the 2000s, some personalities in the Spanish film industry rediscovered Zulueta’s early work: different expositions (paintings, posters and photography) were organized in different Spanish cities such as Madrid or Barcelona; his films were broadcast on TV and cinema again; his short movies were shown on film festivals and Arrebato was first launched on DVD. 'Un, Dos, Tres, al Escondite Inglés' was released on VHS and some of his experimental shorts were launched on a limited DVD release. His death was reported on 30 December 2009. Ida y vuelta (I. Zulueta, 1967, cortometraje). Último grito (1968, televisión). Un, dos, tres, al escondite inglés (I. Zulueta, 1969). Ginebra en los infiernos (J. Chávarri, 1969, cortometraje). Estado de sitio (J. Chávarri, 1971, cortometraje). La Calle 42 (Lloyd Bacon, 1933, reposición en el cine California, 1972). Yellow Submarine (G. Dunning, 1968, proyección en el cine California, 1973). La caída de Sodoma (P. Almodóvar, 1975, cortometraje). Furtivos (J.L. Borau, 1975). I Festival de Villabonne-sur-mer (1976). The Bus (Bay Okan, 1976). Asignatura pendiente (J.L. Garci, 1977). Camada negra (M. Gutiérrez Aragón, 1977). Viridiana (L. Buñuel, 1961, reestreno, 1977). XXIV Festival Internacional de Cine de San Sebastián (1977). El corazón del bosque (M. Gutiérrez Aragón, 1978). Leo es pardo (I. Zulueta, 1978, cortometraje). México, México, ra, ra, ra (G. Alatriste, 1978). Simón del desierto (L. Buñuel, 1965, reestreno, 1978). Arrebato (I. Zulueta, 1979). Cuentos eróticos (E. Brasó y otros, 1979). Maravillas (M. Gutiérrez Aragón, 1980). La jungla de asfalto (J. Huston, 1950, reposición, 1981). Laberinto de pasiones (P. Almodóvar, 1982). L'Age d'Or (L. Buñuel, 1930, reposición, 1983). Entre tinieblas (P. Almodóvar, 1983). ¿Qué he hecho yo para merecer esto? (P. Almodóvar, 1984). I Semana de Cine Experimental de Madrid (1991). Demasiado corazón (E. Campoy, 1992). Dime una mentira (J.S. Bollaín, 1992). La vida láctea (J. Estelrich, 1992). Ataque verbal (M. Albadalejo, 1999). Ciclo Marlene Dietrich (1999). Ciclo Buñuel (Zaragoza 2000). Leo (J.L. Borau, 2000). Exposición Kubrick 2001 (San Sebastián, 2001). Painting titled 'Víctima' (1958). Watercolour titled 'Como al encontrarnos' (1958). Watercolour titled 'Cuando la hierba crece' (1958). Series of drawings 'Nueva York' (1964). Album cover Vainica Doble (1971). Decoration for club Drugstore Spectros (San Sebastián, 1971). Promotion material for shop Noé (San Sebastián, 1971). Advertising for concerts in Cadarso (Madrid, 1973). Comic-book titled 'Supermal' (1973). Series of drawings 'Ibiza' (1973). Ilustrations for children's book La nueva historia de Peter Pan de Juan Tébar (1973). Painting titled 'The Habitat Scrapbook Collages' (1974). Series of drawings 'Marruecos' (1976). Album cover Contracorriente (1976) by Vainica Doble. Publication titled Cine español de la República del XXV Festival Internacional de Cine de San Sebastián (1977). Publication titled Dibujo animado español del XXV Festival Internacional de Cine de San Sebastián (1977). Publication titled Pasolini para el XXV Festival Internacional de Cine de San Sebastián (1977). Album cover Brakaman (1977). Promotion material for music group Negativo (1978). Album cover Muñeca Hinchable (1979) by Orquesta Mondragón. Drawing 'Autorretrato' (1980). Hand programme for XXIX Festival Internacional de Cine de San Sebastián (1981). * Publication titled Henry d'Abbadie d'Arras, XXXVIII Festival Internacional de Cine de San Sebastián (1990). * Series de polaroids retocadas ('80s). OST of Leo Es Pardo (I. Zulueta, 1976). OST of Arrebato (I. Zulueta, 1979). External links Official Ivan Zulueta website Iván Zulueta at IMDB.